The students learning style progresses from time to time. In reality, there are a lot of teaching methods that aren't adjusted to the students learning style. The teaching methods that have not evolved resulted in lack of interest to pay attention to the lesson. One way that can be done to cope with the changes in learning style that occurs is to collaborate fun game and accounting subjects using edutainment approach. The object of this study is the high school students who are studying accounting. The period used is cross sectional by taking samples at high school students majoring in Social XI classes from July to November. To find the results of their interest and the students feedback using the observation method, assessment of pre-test and post-test, questionnaires and interviews. This research indicate that the use of board game increase the learning interest from the students and teachers, to increase understanding of the material in the basics of accounting. A, Ismi Yunita; WIRAWAN, Adhicipta R. Perancangan Media Board Game menggunakan Pendekatan Edutainment untuk meningkatkan Minat Belajar Dasar Akuntansi pada Sekolah Menengah Atas Jurusan Sosial. Akuntansi dan Teknologi Informasi, [S.l. ], v. 11, n. 1, aug. 2017. ISSN 2614-8749. 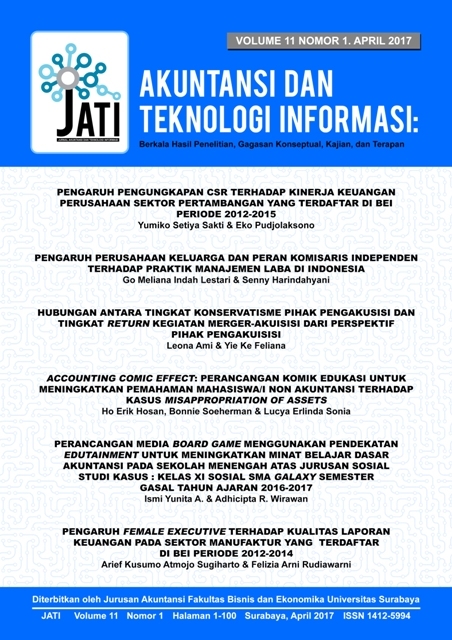 Available at: <http://journal.ubaya.ac.id/index.php/jati/article/view/326>. Date accessed: 26 apr. 2019.